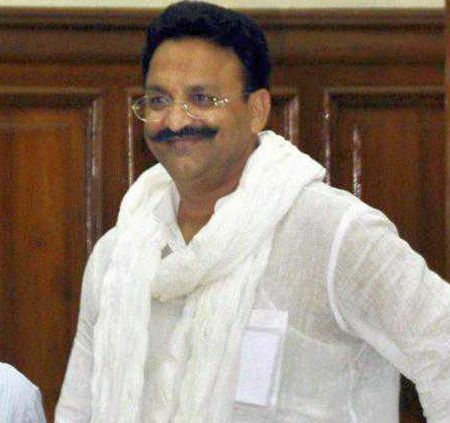 Gangster-turned-politician Mukhtar Ansari's Quami Ekta Dal, whose merger with the Samajwadi Party last year had triggered turmoil in that party, on Thursday merged with the Bahujan Samaj Party, whose chief Mayawati claimed that all criminal cases against him are "false". Announcing the merger of his party in presence of Mayawati in Lucknow, QED president Afzal Ansari, Mukhtar's brother, attacked Chief Minister Akhilesh Yadav, describing him as "anti-muslim and a betrayer". Mayawati, while claiming that the image of the Ansari family was being "maligned" by political rivals by framing them in "false cases", said Mukhtar Ansari, his son Abbas Ansari and brother Sigbatullaha are being given party tickets from Mau, Ghosi and Mohmadabad seats, respectively, to contest the upcoming assembly polls. On the occasion, Afzal said, "The Ansaris will expose Akhilesh and work to strengthen the BSP." In June last year, the QED had announced merger with the Samajwadi Party in presence of Shivpal Yadav, the then state unit president of the party. However, that was cancelled soon after as Akhilesh vehemently opposed the move. This led to a major fight between Akhilesh and his uncle Shivpal, finally culminating in split in the party. "They (Ansaris) were earlier in the BSP and contested polls with our tickets but left under pressure from the Samajwadi Party," Mayawati said. Ever since Akhilesh fielded Altaf Ansari from Mau Sadar seat, from where Mukhtar is the sitting MLA, there has been speculation that the merger of the QED and the Samajwadi Party will become redundant. Afzal claimed that last year, Mulayam Singh Yadav and his brother Shivpal had themselves got the QED merged with the Samajwadi Party but it was rejected later because of infighting. "The Samajwadi Party invited us at the time of getting support for the Rajya Sabha elections but later rejected us," the QED leader alleged, adding, "I had been hearing and even Mulayam Singh Yadav had said that Akhilesh is anti-minority and this has been proved now." Mayawati claimed that Mukhtar's name came up in the murder case of BJP MLA Krishnanand Rai and the CBI is probing it. "As per the Ansari family, even after the CBI probe, no evidence against him came to the fore," she said. "The BSP is not only a political party but a social revolution. We want those who took wrong path and were in bad company to join mainstream," Mayawati said. "My party has never allowed any kind of discrimination against any individual belonging to any society or community who has been framed in criminal cases but has tried to ensure that they get full justice," she said. However, she named a number of leaders in the Samajwadi Party and the BJP with criminal antecedents, like Atiq Ahmed, and said they will not be allowed entry in her party. "Many of these had bowed before my government and promised that they will not resort to such activities but went back on their words after becoming MPs and MLAs," the BSP supremo claimed, adding, "They will have to first end all their open and behind the scene criminal activities." On this occasion, Sabhajit Yadav, a retired judge of the Allahabad high court also joined the BSP.